EasyXLS™ library allows you to export a DataSet to an Excel file. The data in cells can be formatted using predefined formats or user-defined formats. The below example shows how to export DataSet to Excel in C#, VB.NET, C++.NET and J#. sQueryString += "P.ProductName AS 'Product Name', O.UnitPrice AS Price, "
sQueryString += "O.Quantity, O.UnitPrice * O. 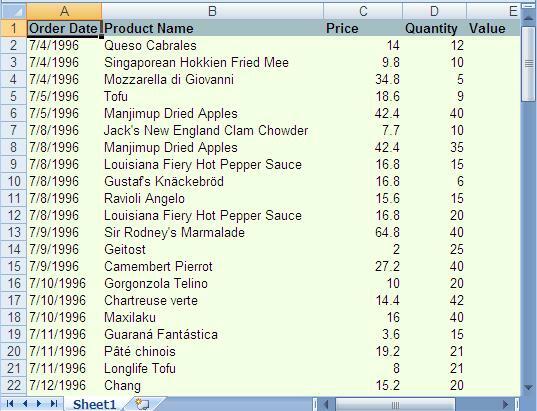 Quantity AS Value "
The screen shot below provides an example of exported data to Excel file from a DataSet. This code sample shows how to export a DataSet to XLS file. Similarly, you can export a DataSet to XLSX file using ExcelDocument.easy_WriteXLSXFile_FromDataSet method or export DataSet to XLSB file using ExcelDocument.easy_WriteXLSBFile_FromDataSet method. After installation, you will need to create a C#, VB.NET, C++.NET or J# project and add a reference to EasyXLS.dll.